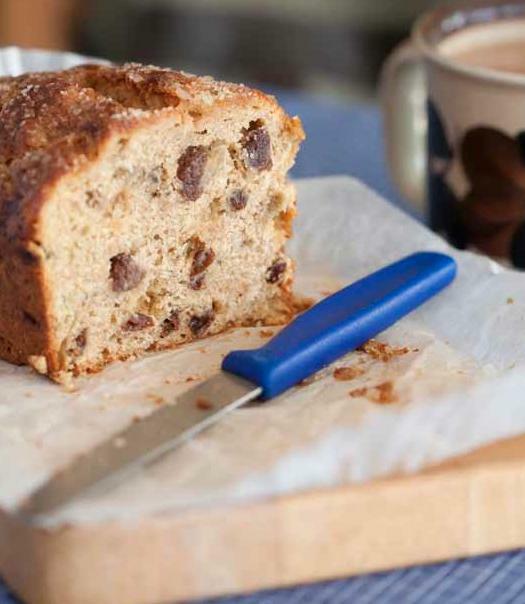 This fragrant, gently spiced tea bread is a true pick-me-up perfect for ravenous children returning from school, or anyone in need of cheering up. Bananas become much sweeter and more deliciously scented as they mature, so make sure the ones you use are well ripened. They will be much easier to mash too. Serve this tea bread thickly sliced - just as it is or with butter. After a few days, it's best lightly toasted and buttered. Sift the flour, salt and ground cardamom into a large mixing bowl. Add the muscovado sugar and raisins and mix lightly until well distributed. Make a well in the centre. Spoon the mixture into the prepared tin, levelling it out with the back of the spoon. Sprinkle the demerara sugar over the top. Bake for about 45 minutes until well risen and a skewer inserted into the centre comes out clean. This cake will keep for 5 days in an airtight tin and freezes superbly.